Anti-Brexit demonstrators wave flags outside the Houses of Parliament in London. File photo: Reuters/Toby Melville. 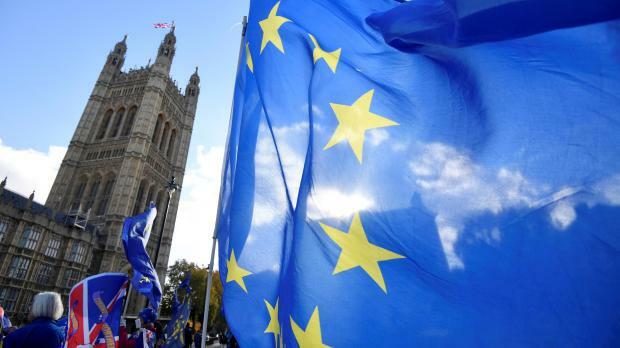 The Malta Business Bureau (MBB) has welcomed the EU decision to endorse the Brexit agreement negotiated between the European Commission and the UK government. EU-27 leaders formally agreed a Brexit deal at a Brussels summit on Sunday, urging Britons to back Prime Minister Theresa May's package, which faces furious opposition in the British parliament. The agreement comes just months ahead of the UK's withdrawal from the EU on March 29. In a statement on Monday, MBB President Simon De Cesare said: "The endorsement by the EU member states confirms that in spite of the UK’s decision to leave the EU being regrettable and that the outcome will have negative repercussions for both sides, the EU is committed to an orderly end of the current relationship, and is committed to negotiate a future economic and security partnership, while preserving the integrity of the European Single Market." Politicians need to put radical ideologies aside. No circumstances justify a no-deal Brexit. He added that the agreement paved the way for a transition period that preserved the status quo at least until the end of 2020 and allowed businesses a smoother transition and more time for preparation. Despite the positive outcome of Sunday’s decision, however, the bureau said it was still very concerned about the political uncertainty in Britain and over whether the deal would be approved by the UK Parliament. "Politicians need to put radical ideologies aside and be more sensible to the facts and the implications on the economy, businesses as well as the impact on citizens. No circumstance justify a no-deal Brexit," Mr De Cesare said. The MBB invited business operators and professionals with interests in the UK market to be informed and prepared for any eventuality that the departure of the UK will unavoidably bring, to avoid any disruption that could potentially come into effect as soon as four months from now.